Tomorrow I will be celebrating the sixth anniversary of this blog. Some of you may think it’s a little silly to party it up over that, but I’m the same person that wants a big deal made of my birthday, as long as we don’t linger on how many candles there are on the cake. Just ask my poor husband. This isn’t only about the numbers though. It’s about feeling like I’ve accomplished what I set out to do, even on a small level. I wanted to encourage my sewing and crafty readers to try new things, and not feel held back because they don’t think they’re creative. Everyone is, they just have to find The Thing. There’s a project out there that’s fun to make, easy enough but challenging enough, that they can be proud of. It’s just a matter of figuring out what that is. If I’ve convinced or helped anyone find that during these past six years, I’m happy. 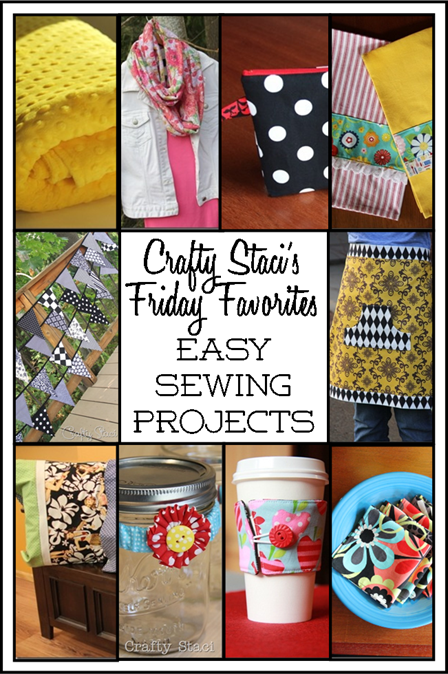 Ordinarily I dedicate this volume of Friday Favorites to the most popular projects over the life of Crafty Staci. However, this time I’d like to do something a little different. I’d like to showcase ten of my favorite easy-to-sew projects over the years. It seems fitting to my mission statement, and a good way to start out year seven. In case you’re interested in the top ten, I’ll list those at the end. Let’s get sewing! The most evergreen project you’ll find here, the one that’s my most pinned, most linked, most viewed and led to a year-long series, is my Reversible Coffee Cup Sleeve. I can’t even tell you how many hundreds of these I’ve made over the years, and I honestly still love them. This Fat Quarter Half Apron doesn’t require many supplies and is very easy to make. You could even leave off that front pocket, or turn it into a simpler square. As I was looking back at projects, I realized how much I’ve sewn for my yellow-loving daughter, including this Easy Double-Sided Fuzzy Blanket. The great thing about these Simple Cloth Napkins is that with the right fabric choices you can make an impressive gift with minimal sewing skills. This Mason Jar Scrunchie is just a little thing, but it can be used to fancy up a jar, candle, or even a ponytail. When you’re ready to stretch those shiny new sewing skills and try out a zipper, there isn’t a project much better for it than this Easy Lined Zippered Bag. Since this fashion trend doesn’t seem to be leaving anytime soon, learn to make this Easy Floral Infinity Scarf and your wardrobe will thank you. Embellished Kitchen Towels are a great wedding shower gift. Match them with the apron and napkins above for a fancy, one of a kind set! Whether you make this Hot and Cold Pillowcase with the fleece side, or just cotton all the way around, it’s one of the easiest projects out there. It’s also a great birthday gift for kids from kindergarten up through high school. Trust me, I tested that. Hard. I originally made this Fabric Bunting with One Piece Triangles for my craft show display, but it’s now hanging in my sewing room. I’m pretty sure I need a string of these in every color to celebrate every holiday. What color is sixth blog anniversary? If you’re curious about what the most popular posts have been, here’s a rundown of the top ten of all time, starting with number ten. Number one will never change! Since I believe in anniversary presents for you, be sure to come back next Wednesday to enter to win my giveaway. My husband helped me pick out some really cute fabric and goodies!